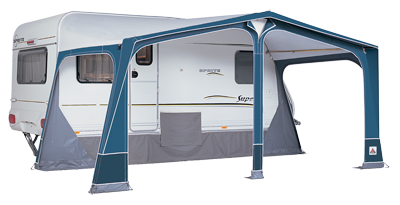 This proven model is voted by us as our best selling awning and is manufactured to the strict and technically advanced production techniques of Dorema for the Australian market. Daytona awnings are light and bright while also giving you the choice of adding options such as an annex room or a front porch canopy as shown below. Alternatively the walls may be removed to allow maximum air flow and use the Daytona as a large sun canopy. 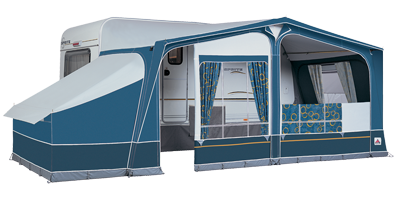 The Daytona shown below in charcoal/grey, window curtains come as standard on all Daytona’s. As standard this awning comes supplied with a 25mm galvanised easy grip steel frame, Dorema’s patented quick lock fittings which give an easy roof pole fitting to the caravan and the safe lock system storm straps, a lightweight Aluminium easy grip quick system frame is available as an option along with others options such as the extended annex shown above, an awning porch canopy and veranda poles. 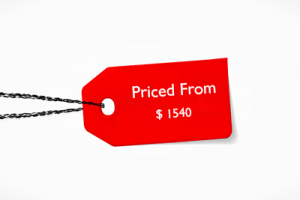 Please note: Prices quoted for the Daytona are for the smallest size awning available and without any optional extras, quoted price includes delivery to your door within Australia.